Event tracking on twitter is a good way of finding out what the most important topics are. 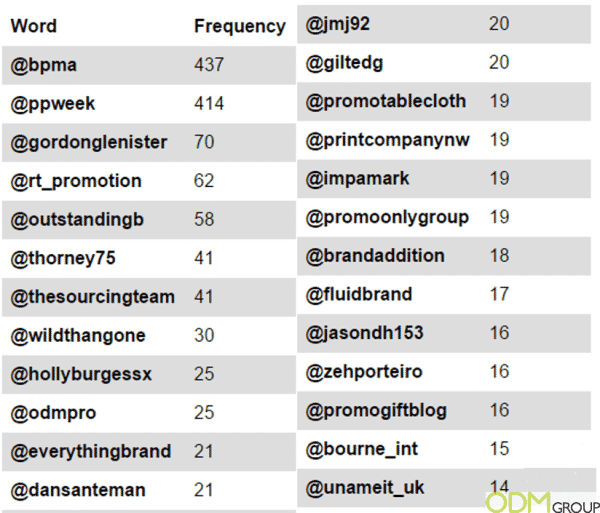 BPMA’s Promotional Products Week (PPWeek) has just finished and ODM has been tracking this event. PPWeek is a celebration of the Promotional Products Industry. The aim of PPWeek is to nationally raise the profile of promotional products and encourage their use within the marketing mix. For this year’s PPWeek the ODM group followed the event closely and gathered information from over 2000 tweets before and during the event. After analyzing this information we created the following word cloud, with the number of mentions being represented by the size of the word. What was our conclusion from this event tracking? As seen in the word cloud the big focus was on various types of promotion occurring during PPWeek. 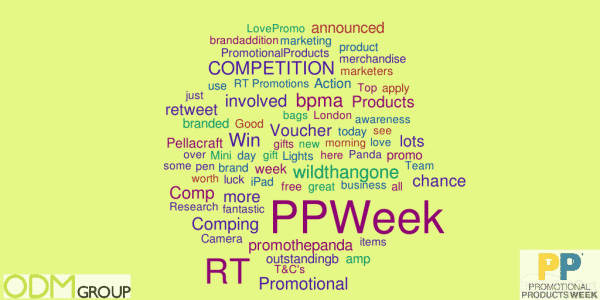 Notable tweets included words: PPWeek, Competition, bpma and RT. Though there were interesting mentions of promothepanda and wildthangone. These word clouds are great at understanding what it is that attendees are talking about and what they find to be most interesting from this event. Promotional Product Week showcased promotional merchandise at its best highlighting its essential role in the marketing mix and explaining why it was continually used by marketers keen to make an impact. This year’s PPWeek coincided with the approaching Rugby World Cup which had sparked a new demand for branded promotional items, with sponsors and brands hoping that the euphoria of the event would allow them to engage with their customers on a very personal level, trying to give them mementos of the event that they will keep for years.